Dr. Park believes that your improved dental health will take a team effort. He also understands that technology makes it easier for you to participate in the critical decisions that involve your teeth and gums, which why he uses the intra-oral camera. 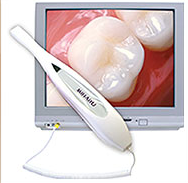 This small, advanced video camera produces a close-up picture of the inside of your mouth. When you can see for yourself why certain areas need help, you can be more fully engaged in each treatment decision.